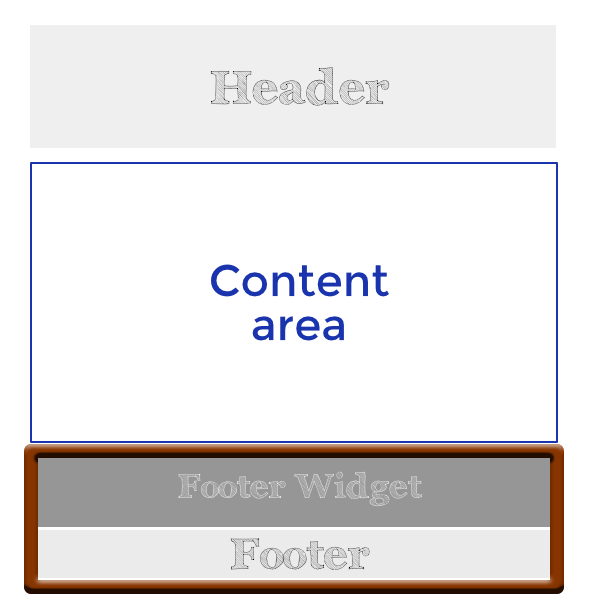 The Footer-type Themer layout in Beaver Themer overrides your theme's footer and footer widget (if there is one) area at the bottom of a page, as shown in the following diagram. Here's the initial layout that you see when you create a Footer-type Themer layout. It's there to give you some ideas about how to customize your own layout. Two rows, one for the footer widget and one for the footer. Both rows have an initial purple background color. The footer widget area has three columns with Heading modules. The left column has Icon modules for contact information, and the middle and right columns have Text Editor modules. Tip: There are no field connections in the modules used in the initial layout for the footer widget, though you can add them. For example, the footer widget row background for a post could be set to display the featured image for that post, or the author's name and bio. The footer contains a field connection shortcode for the site title, embedded in a Text Editor module. The copyright year and other text are static. This means that you'll have to manually renew the copyright every year. Tip: If you ever want to revert to this default layout, click the Templates tab in the Content Panel (Page Builder 2.x) or the Templates button in the upper right corner (Page Builder 1.x) when you're editing the Themer layout in Page Builder. Then click the Footer template. For information about how to make footers sticky in a footer Themer layout, see Neil Gowran's blog post at WP Beaches.